On the first day of Black History Month, we are delighted to feature and honor Ernestine Nettles, who this Christmas celebrated 50 years of service—not only to GLIDE, but to her community in Oakland, the Civil Rights Movement, gender equality and voting rights. Ernestine Nettles with Rev. Cecil Williams and Janice Mirikitani. Ernestine is a beloved pillar of the holiday feasts GLIDE organizes for its community. In fact, Ernestine is well known among holiday volunteers for being the first person to arrive on Thanksgiving morning, usually around 5:30 am. A couple of years ago she discovered that some of the younger volunteers had started a competition among themselves to see who could beat Ernestine to GLIDE on Thanksgiving Day! Jennifer Gentile, a Holiday Volunteer Captain for 16 years, has many fond memories of working with Ernestine. Jennifer mentioned that despite Ernestine’s years of working at GLIDE, this was the first holiday that she had her photo taken with Jan and Cecil. “She’s very humble, and generally avoids any attention and certainly the spotlight, but 50 years of volunteering? That’s something!” says Jennifer. A committed activist and changemaker immersed in the Civil Rights Movement, Ernestine began volunteering with GLIDE in 1968 after meeting Janice Mirikitani and Rev. Cecil Williams while they were campaigning for the right to vote for 18-year-old Americans, and for girls’ and women’s right to wear pants to public school. To have a cause that has stood the test of time and remained true to the initial dream is truly a blessing in these days. “Cecil worked vigorously with the youth. Of course, he himself was young at the time! We got the legislation passed for the 18-year-olds’ right to vote, and we also went through the school boards and got the girls’ right to wear pants,” she says. 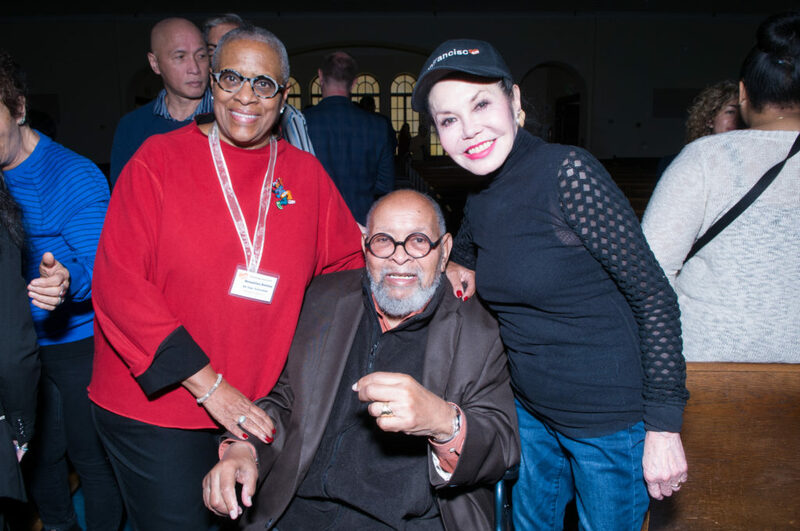 Due to their overlapping work, Ernestine has many recollections of Janice and Cecil over the years, and great insight into the trajectory of GLIDE’s programs. GLIDE Co-Founder Janice Mirikitani recalls working alongside Ernestine during pivotal social justice campaigns. One of the things I tell young people is that when you’re looking at the issues and you’re looking at those candidates, make sure they have the right consciousness. Besides her consistent volunteer work with GLIDE, Ernestine is highly involved in her local community. She is currently a Contract Compliance Officer with the City of Oakland, where she works to make opportunities available to small and very small local businesses. But creating opportunities and paving the way for others is not just her profession; it is truly her life’s work. She is one of the Vice Presidents of the Oakland League of Women Voters; one of the largest leagues in the country. Ernestine registered voters at the Women’s March and is passionate about transparency and responsibility when it comes to political fundraising. I think everybody should be responsible for some one who is less fortunate than them at some point along their journey. Like GLIDE and Cecil preach, we can’t be judgmental. Additionally, Ernestine helped the late Mrs. Ethel Bradley, wife to Tom Bradley who was the first Black mayor of Los Angeles, build the Tom and Ethel Bradley Foundation. She works with Charles Blanchard in the National Association of Black Veterans, and she has worked closely with former Mayor of Oakland and House Representative the late Ron Dellums. In fact, Ernestine was Dellums’ very first intern in Washington D.C. She is also still connected with one of Dr. Martin Luther King, Jr.’s aides, JT Johnson, of Atlanta, and this past summer she joined JT and his wife on a trip to Alabama. Still more, she is involved with the MLK Jr. Freedom Center at Merritt College, and sponsors children to play Little League Baseball in Oakland. Ernestine at one point also took in a homeless couple, after seeing the numbers of unhoused people in Oakland rise year after year. Ernestine speaking at GLIDE Church during Christmas Celebration. While her family was not wealthy, she says her parents taught her that you can make a difference by sharing what you have with those around you who are in need.